These dice are for the wiggle worms on your caseload! 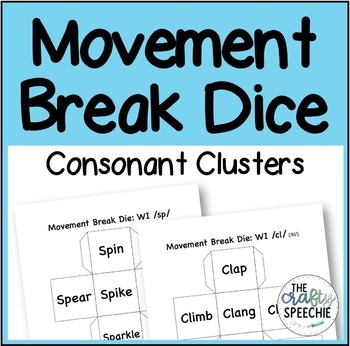 I have found that I get more out of my articulation clients when I add movement to our sessions and these dice have done the trick! 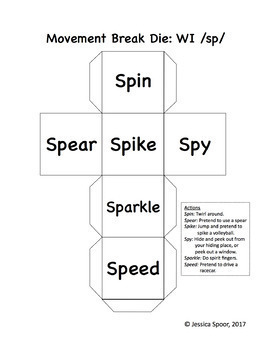 This download includes 32 dice for /sp, st, sk, sm, sn, sl, sw, spɹ, stɹ, skɹ, skw, pɹ, bɹ, fɹ, θɹ, tɹ, dɹ, kɹ, gɹ, pl, bl, fl, kl, gl/. Some dice target only one cluster and others are mixed. 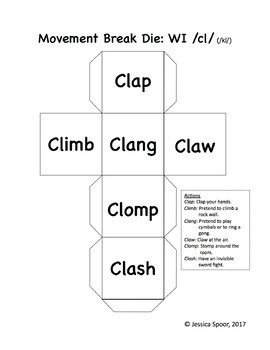 Each page includes a die and descriptions of the actions to go along with verbs. 1. Select a die based on your client’s current speech goal. 2. 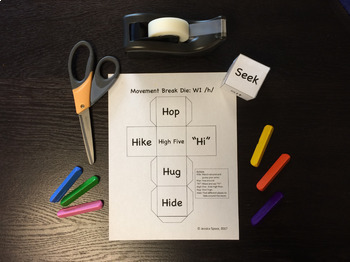 Print the die on cardstock or regular paper. Cut out the template and tape together by the flaps. 4. Repeat Step 3 as many times as you like!